We were discussing Otto cycle, an ideal cycle for internal combustion spark ignition reciprocating engines or simply petrol engines, in our recent post. We have also discussed the derivation of efficiency of Otto cycle and volumetric efficiency of Otto cycle. Today we will see here another air standard cycle i.e. Diesel cycle. Diesel engines are operated on the principle of Diesel cycle. Diesel cycle is one type of air standard cycle which is designated as the ideal cycle for the operation of internal combustion compression ignition reciprocating engines. Before understanding the diesel cycle, we must be aware about the operations performed by a reciprocating compression ignition engines or simply Diesel engine. Therefore first let us see an overview of internal combustion compression ignition reciprocating engines. Basic components of internal combustion compression ignition reciprocating engines are displayed here with the help of following figure. The inner most position will be termed as inner dead center (IDC) and at this state piston will make lowest volume in the cylinder. IDC i.e. inner dead center will also be termed as top dead center (TDC) if engine is one vertical engine. Second fixed position will be termed as ODC i.e. outer dead center and at this state piston will make largest volume in the cylinder. Outer dead center will also be termed as bottom dead center (BDC) if engine is one vertical engine. 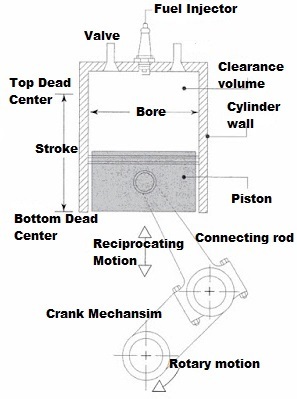 Piston will also be connected with crank lever mechanism as shown in above figure and therefore reciprocating motion of piston will be converted in to rotary motion and vice versa. Piston will move within the cylinder and when piston will move from one dead centre to another dead centre such as IDC to ODC then that movement of piston will be termed as stroke. Now we will start to understand the Diesel cycle with step by step and simultaneously we will draw here the PV diagram also for the Diesel cycle. So let us start our cycle with IDC i.e. from inner dead centre. When piston will be at IDC, intake valve will be in open condition and exhaust valve will be closed. In this situation, pressure inside the cylinder above the piston will be approximately equivalent to atmospheric pressure. When piston will start to move towards ODC or BDC, air above the piston will start to expand as piston will be moving downward towards ODC. 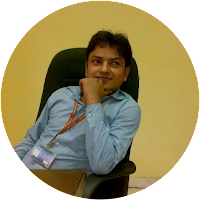 Therefore pressure will be reduced below the atmospheric pressure and hence suction pressure will be created and hence fresh air will be admitted in to the cylinder through the intake manifold. We must note it here that this is the basic difference between Otto cycle and Diesel cycle that in case of Otto cycle, fresh mixture of air and fuel will be admitted in to the cylinder during the suction stroke through the intake manifold. There will be one igniter and igniter will start the burning of mixture of air and fuel. While for Diesel cycle, fresh air will be admitted in to the cylinder through the intake manifold. There will be one injector of fuel and it will inject the fuel during combustion stroke. Now let us consider this situation clearly, piston is moving downward and suction pressure created and therefore fresh air is coming in to the cylinder and therefore pressure will be equalize here due to admission of fresh air. In simple we can say that admission of air in to the cylinder will be done at approximately constant pressure. This process is displayed in PV diagram by process 0 to1. When piston will reach to ODC, intake valve will be closed and hence we can say that in this situation both valve will be closed. Intake valve and exhaust valve both will be in closed position and cylinder will be filled with fresh air when piston will reach to ODC or BDC. Now when piston will start to move towards IDC, air will be compressed within the cylinder due to movement of piston towards IDC. When piston will reach IDC, piston will made lowest volume in the cylinder and hence air will be compressed. Hence pressure and temperature of working fluid i.e. air will be high and we must note it here that cylinder will be insulated and hence there will not be any transaction of heat energy during this process of compression of air. Pressure and temperature developed, due to the compression of air, at the end of compression stroke will be quite high as compared to that of petrol engine. This process is displayed in PV diagram by a process 1 to 2 and this process will be isentropic process. As we can see above figure, there will be one injector of fuel and it will inject the fuel during combustion stroke. As we know that molecular mixing of fuel and air will be required for the burning and therefore any liquid fuel must be vaporized first so that fuel and air may mix with each other as desired. Fuel in liquid phase could not mix as desired with air because molecular mixing of fuel and air will not be possible in different phase. Fuel at very high pressure will flow through a fuel injector and fuel jet will be discharged through the orifice of fuel injector at very high speed. Fuel i.e. Diesel will be injected by the fuel injector in the form of atomized spray. Therefore as we have studied that air will be at high pressure and high temperature at the end of compression stroke, heterogeneous combustion will take place as fuel will be injected in the form of atomized spray. 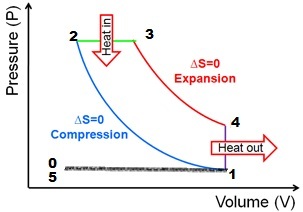 Hence pressure and temperature of the product of combustion will be increased due to the heterogeneous combustion process. We must note it here that this combustion process will be carried out with constant pressure process. This process is displayed in PV diagram by a process 2 to 3 and this process will be constant pressure process. This is one more difference between Otto cycle and Diesel cycle. Combustion process in case of Otto cycle will follow the constant volume process and if we talk about Diesel cycle then combustion process will follow the constant pressure process. Now due to high pressure and temperature of the combustion product, piston will start to move towards ODC. We can say that piston will move from IDC to ODC and we must note it here that for this process also entropy will be constant because there will not be any heat energy transfer during this process 3-4. Process 3-4 will also be termed as power stroke of Diesel cycle. As piston will move from IDC to ODC due to high pressure and temperature of the combustion product, crankshaft will start to rotate and will develop the useful work. Now piston will be at ODC and in this case exhaust valve will be opened and therefore combustion product will leave the cylinder through the exhaust valve. This process will be so instantly that we can assume that this process will be constant volume process. This process is displayed in PV diagram by a process 4 to 1 and this process will be constant volume process. So let us see the above PV diagram, Heat energy will be added to the system during the process 2-3 and heat energy will be rejected during the process 4 to 1. Work energy will be done over the system during the compression stroke or during the process 1 to 2 and work energy will be produced as useful work during the expansion process 3 to 4. Now piston will start again to move towards IDC in order to remove the rest combustion product from the cylinder, piston will be moving towards IDC and compressing the combustion product but same time combustion product leaving the cylinder through the exhaust valve and hence we can say that pressure will be constant. In simple way, we can say that exhaust stroke will be done at constant pressure process and this process is displayed by the process 1 to 5. Cycle 1-2-3-4-1 will be termed as Diesel cycle. 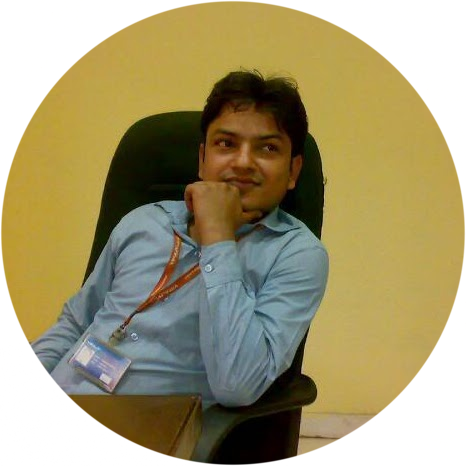 Diesel engines are working on the principle of Diesel cycle. Piston executed here four complete strokes and crankshaft will rotate by two revolutions for each thermodynamic cycle.